Ensuring our partners and customers get the most out of the e-Commerce solution is our priority. 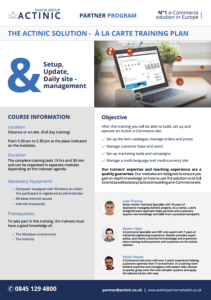 To provide business goal-aligned training solutions for our partners, we have designed a new "A la carte” training plan on the Actinic solution, comprising of 13 modules, which can be delivered in a classroom setting (groups or individual) or in an online training environment (tele-conference). The course is aimed at teaching our partners to set up, update and manage the solution. The total duration of this course is 19 hours and 30 minutes, but each module can be purchased separately to suit your schedule and training needs. Full training days (7 hours) can be organised on-site. An effective e-Commerce site creates an easy online shopping experience. An ideal shopping experience should be guided, encouraging and geared towards motivating the customer to add a product to the cart. These 3 tips will help your customers reduce their drop-out rate. Provide a progress indicator : Creating a progress indicator that shows where the customer is at and how many more steps to the finish line is a great way to avoid them feeling abandoned. Website speed and availability : One of the most frustrating things that a visitor can experience is slow site loading time. About 46% of customers will not hesitate to drop their cart if the site speed is slow. Remove the sign-in/ sign-up feature : Tear this feature down for a faster checkout. Alternatively, activate the guest checkout feature that allows users with one or few items simply check out without hustle. While there are many reasons cited for cart abandonment, one of the major reasons is the lack of trust. Your customers should add trust building elements such as secure payment methods, return policies and contact information to trigger a purchase. A large number of online shoppers abandon their carts without completing the entire process. 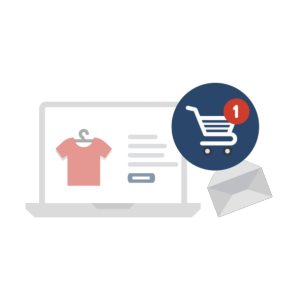 Your customers can gain about 20% conversion rate by sending cart recovery emails to visitors in a bid to encourage their return to the site to complete their transactions. Providing the option for new customers to enter the checkout without having to login or create an account can reduce your customers' cart abandonment rate by 45% (Source: Econsultancy)! Actinic experts have developed a feature which allows your visitors to place their order without creating a customer account and directly access the payment pages. It streamlines the purchasing funnel and reduces the steps to the payment pages. Your customers can activate this feature right from the Actinic back office, in just a few clicks. This is free of charge! 80% of the major American retailers, such as Walmart, Office Depot, Dell or Best Buy, already offer the guest checkout! 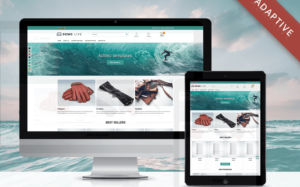 Actinic has just added 14 new Adaptive Design Templates to its ready-to-use designs store.The adaptive web design allows for the customer to browse through your customer's store using different screens, such as wide screens, with the same visual comfort as when they shop on their desktop. Considering that for 75% of Internet users the quality of a shop’s web design can make or break a sale, choosing one of our professional and adaptive ready-to-use design templates is a great way to convert their visitors into customers (Stanford study). 50% of internet users prefer navigating the net using a 1280-pixel wide screen (Oxatis study 2016). With an adaptive template, your customer's site adapts to any screen, increasing the user experience and the conversion rate! No matter the sector of activity, your customer will find the design that fits its business among a selection of more than 110 templates. The ready-to-use designs have been created with e-Commerce best practices in mind and you can choose a template in the colours of your choice! Premier Equine's e-Commerce website redesign focused on delivering optimal buying experience and improved site management. Actinic’s e-Commerce experts worked towards an optimally performing e-Commerce site, designed to deliver a seamless shopping experience. Discover the 4 key strategies Actinic employed designed to attract more qualified traffic and reach a higher average basket value.